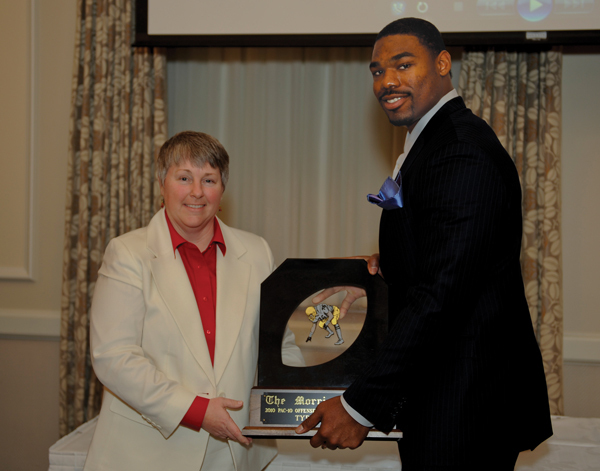 Smith receives the 2010 Morris Trophy from Traci Morris Drake. Smith, a 2-year starter at right tackle, was named to the 2010 All-Pac-10 first team. Behind the offensive line, the Trojans averaged 189.8 yards per game rushing and 431.4 yards of total offense in 2010, while allowing only 18 quarterback sacks (1.38 per game) all year figures that ranked among the best in the nation. Smith becomes the 14th Trojan offensive or defensive lineman to win the Morris Trophy, and the 10th offensive lineman. One of 27 Morris Trophy winners to also be a first round draft choice, Smith was taken 9th overall by the Dallas Cowboys in the 2011 draft. He has missed just one game in his career.